The Aeonian 2018 - Startups and entrepreneurs, time to get recognised! The Aeonian 2018 – Startups and entrepreneurs, time to get recognised! 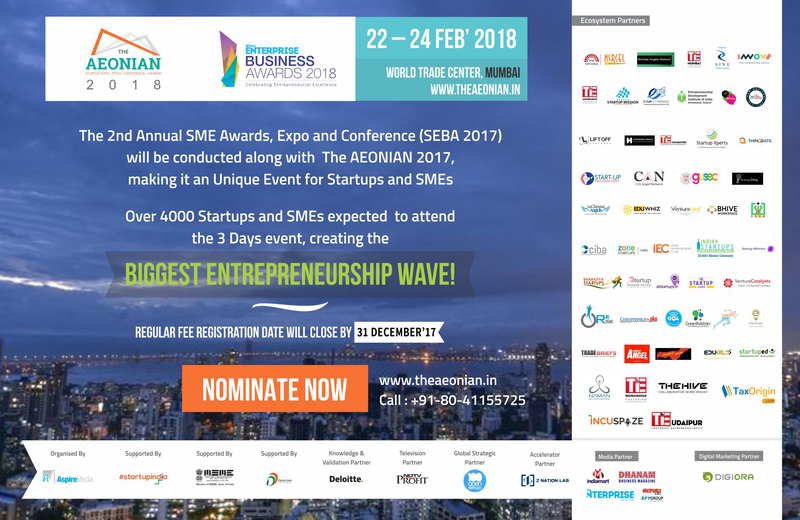 With over 4000 Startups and SMEs expected to attend the 3-day event, The Aeonian has started a huge entrepreneurship wave that has collided with the 2nd annual SME Awards, Expo and Conference (SEBA ‘17) making it a unique event catering to the large masses. Scheduled to be conducted from the 22nd- 24th February at the World Trade Center in Mumbai, free registrations are still open for angel investors, venture capitalists, Incubator/accelerator, working professionals, solution providers, industry experts and even students and freelancers. Up for grabs is seed funding, recognition, networking, building trust with stakeholders and much more. Winners will also be featured by NDTV and receive a 3-month free publication by Aspire, another support partner of the Aeonian. Nominate your Startup or SME today to eligible for grand prizes. The event will also feature a magazine that will be distributed at the venue. Startups and enterprises participating can get in touch with the Aeonian team to get their content posted in the magazine.